Challenge: Create branding for a start up local fish market and gourmet-to-go deli in a small lakeside vacation town that needs to appeal to tourists in the summer months as well as the local population all year long. Define an avenue for sales to restaurants, hotels as well as individual families and the local business population. Create an appeal for everyday and special occasions. Solution: WelchCreative designed a classic seafaring-themed logo that shouts "fresh seafood" and produced business cards, signage and a branded awning for the shop. For the website, we selected beautiful food photography to match the owner/chef's high-end gourmet background and represent the seasonal offerings. We added a detailed "About" section to highlight the owner/chefs impressive and fun background story. 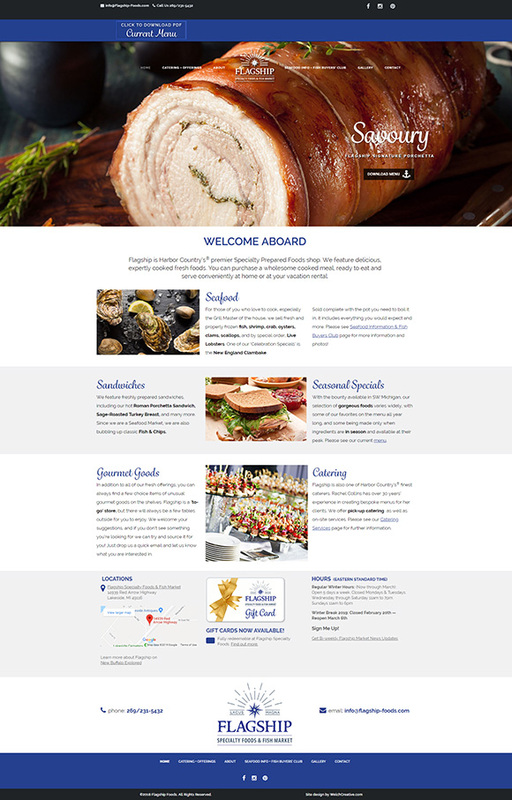 WelchCreative added a catering services and menu page to define additional services offered. We also created an easy PDF download at the top of the page for a changing seasonal menu that is easy to update. Ads were kept simple and direct to appeal to year-round local clientele and highlight the delicious, fast and easy, "prepare at home" offerings. We created a fish buyers club sign up into MailChimp for where clients can place monthly preorders. The club initially targeted restaurant owners and event organizers. We designed an email template so the staff can send out updates, specials and announce preorders for the fish buyers club to the community. Results: Visitors are finding and using the site and come in to the market already knowing what they want, or call ahead and place orders for pick up. The fish buyers club is not only being used by restaurants and hotels but by locals hosting dinner parties and holiday gatherings. After two successful years the owner is opening a second location in a neighboring town and we just completed sister branding for the new shop.